I gathered up some baby wormy-worms from the vermicomposter and put one each in the K-cups with pale colored leaves. 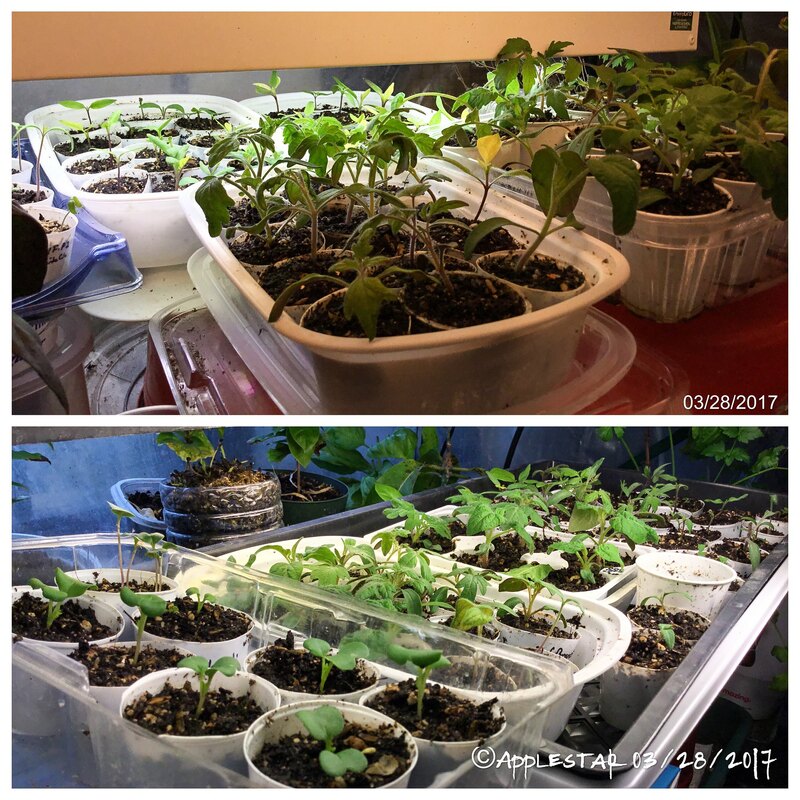 They were started early but have been in the Garage V8 since before the cold snap -- temps in the 30's°F -- so they have been growing very slowly. 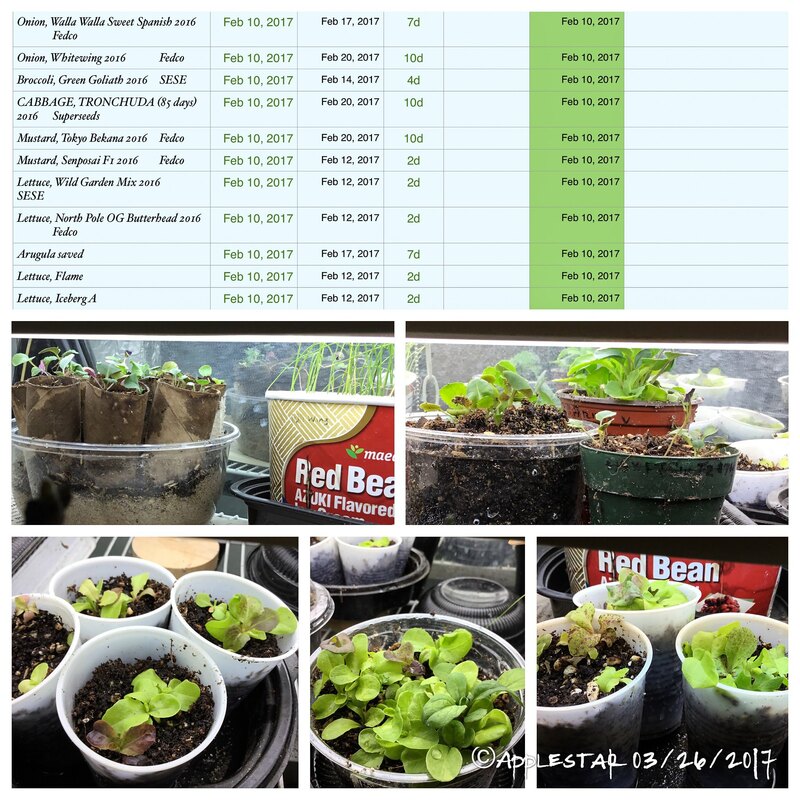 Plus I sometimes forget or didn't want to go out there in the cold, and I let them dry out a couple of times, too.... Then got busy with the solanacea seed starting and neglected them. I uppotted -- a couple of weeks ago? -- when they were looking near death and didn't even make a note of it in my notes. At least they are looking better. I dropped the ball with the onion seedlings because I had meant to push them to grow with extra fertilizer, etc. I should start hardening these and get them ready to plant in the garden. Once the garage temp stabilizes above 50°F, uppotted tomato seedlings will be moved out to the Garage V8. 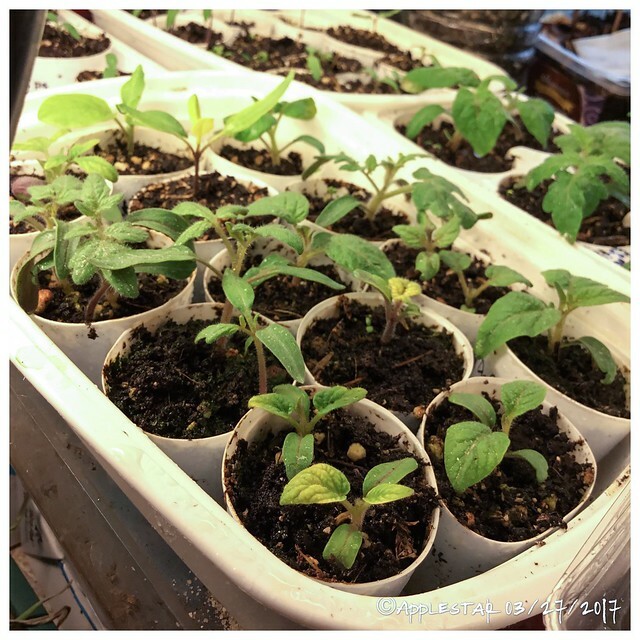 Was separating some seedlings today -- 1 K-cup of Michihili seedlings turned into 7 K-cups, 1 K-cup of supervariegated Fish pepper seedlings turned into 5 K-cups, 1 K-cup of Kamo eggplant seedlings into 3 K-cups with 4 just seedleaf little ones in 1 K-cup (i.e. 6 seedlings total). 13 K-cups exactly fit in the Chinese takeout trays I'm using right now, so these filled another tray. 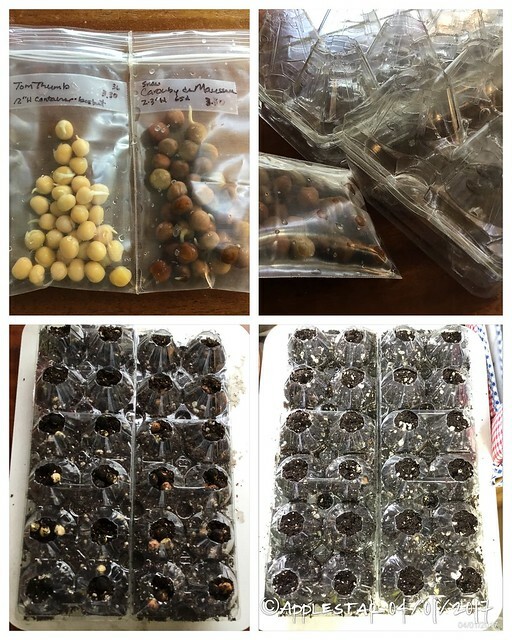 Using recycled the K-cups is a great space saver, but this method, like the spoonzip technique, can lull me into starting too many seeds, then I get in trouble when it's time to uppot them, and eventually when it's time to plant them. So the numbers might seem like a lot but actually represent only about 2 trays of cell inserts worth, I think? The difference as I see it, is that there are NO WASTED CELLS TAKING UP VALUABLE SPACE -- those empties used to drive me mad. The way I'm doing it makes sense for me because the small sandwich clamshells and Chinese takeout trays take up little space and can be tucked here and there between overwintered plants in the Winter Paradise shelves. And the temperatures in the Garage V8 nursery have steadied above freezing by this time to allow some of the overwintered plants in the WP to be moved out to make room. Once the number of growing K-cups reach sufficiency as above they are taking up equivalent space in the WP that can be occupied by webtray/solid trays, and the Chinese take out trays waste space -- filling the 1020 size trays will actually save space because more K-cups fit in same amount of space in the webtray. It looks like It's time to see if I have same size seedlings enough to fill up a webtray -- they have to be same height. Tomato, Mikhalych (tb 2016) that is NOT (it is a PL) -- this might be Amy Sue? ...looks very much like others and the two varieties had been separately potted up in one sitting. If there's a K-cup labeled Amy Sue with RL seedling, that would be the corresponding Mikhalych. 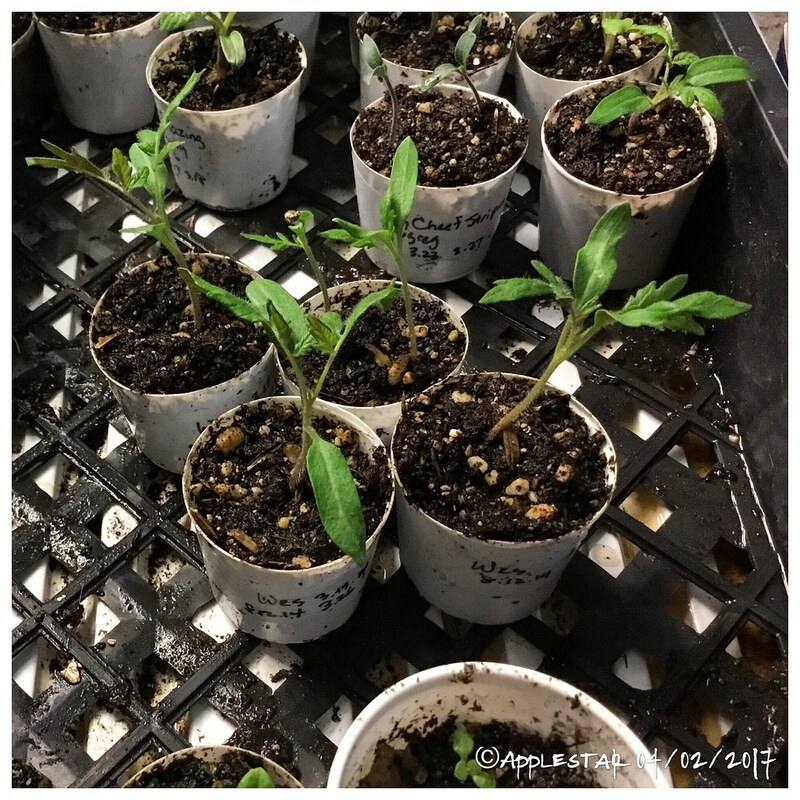 …it's not easy to tell in the photos, but some of the yellowed leaf tomato seedlings have started to green up a bit. A couple of the peppers are still looking a bit critical. Hopefully they will turn around. It's tough to not want to keep trying different things, but I think that would be a mistake. I need to be patient and see if the remedies I already applied will have an effect, or I'll end up killing them with kindness. Hmmm... the extremely pale pepper seedlings? -- I found aphids on those I saw a ladybug in the WP shelves yesterday or the day before, but next time I find one somewhere, I will move it to the seedling trays. I only saw a couple of ants in the Winter Paradise area a few days ago -- maybe it was them, but it IS that time of the year -- I'm eradicating massive invasion from the Winter Wonderland -- they moved into one or two of the orchid containers and the Peach Bhut Not on the Cool Gang floor. Some people don't think it's a good idea to get the seedling foliage wet, but I mist them thoroughly regularly, and aphids "stand on their tippytoes" when you get them wet, lifting their spiricles along their bodies up above the drop of water that cling to them. That's how I spotted them as "unnatural bumps" on the seedlings. With no Garden Patrol to help out, I used my "sharp-pointed bamboo skewer method" to pluck them off the delicate seed and true leaves. Do you grow your onions in clusters? 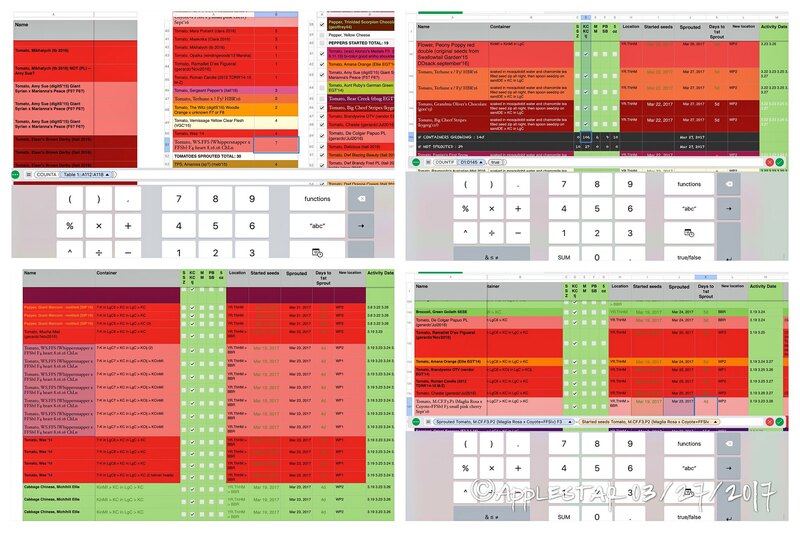 What dimensions do you plant for spacing once you take them outdoors? - The K-cups in Chinese tray in the front need to be uppotted -- all are growing significant roots out of the drainage holes. That one super pale pepper in this tray had two more aphids on it this morning. - The Michihili and broccoli can go out to the Garage V8. 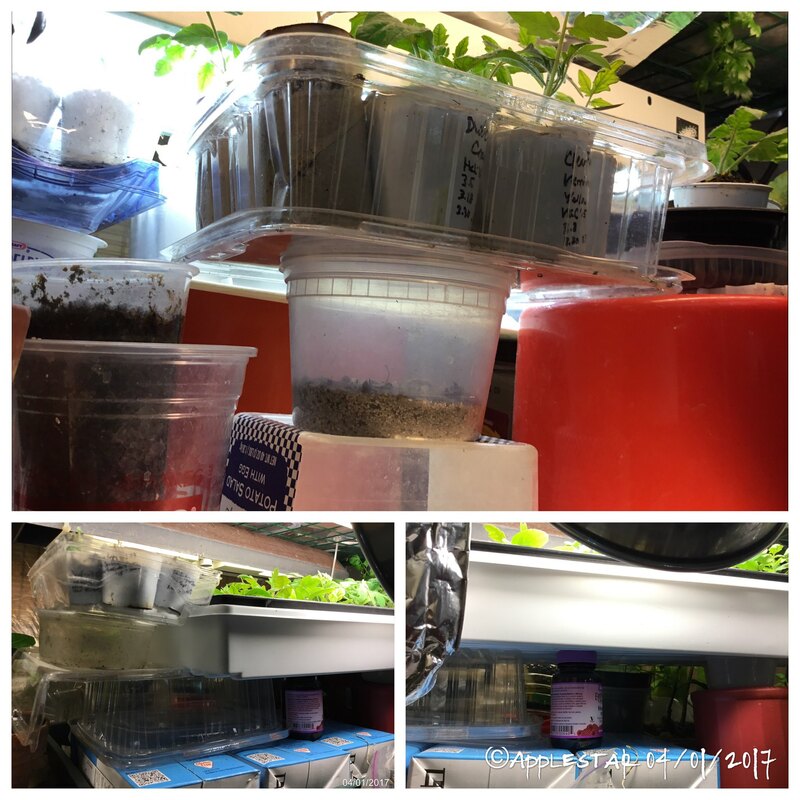 - Consolidated the tomato, eggplant, and tps k-cups in the webtray with plenty of room to spare now for separating multiples and sprouted spoonzips to be planted. - The K-cups in Chinese tray in the webtray are starting to grow some roots out of the drainage holes so need to stay in the drip tray so as not to dry out too much. - The 6 sturdy dwarfs in the larger Mocha Mochi ice cream cells are growing significant roots out of the bottom and need to be uppotted. 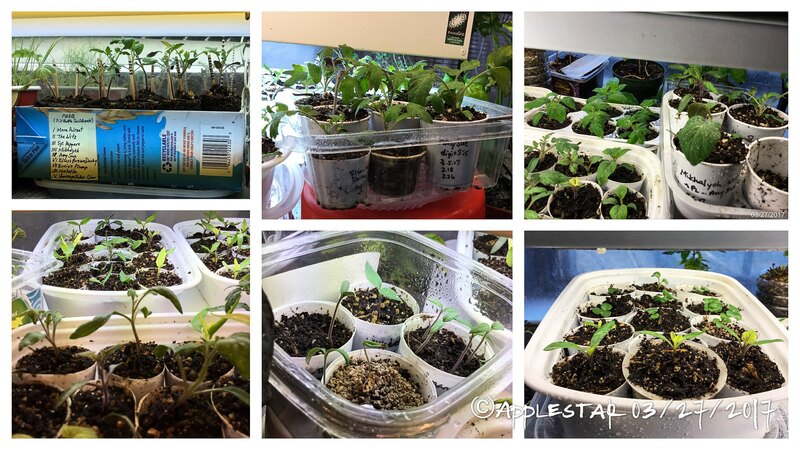 Here are my Wes seedlings -- as you can see, they should have the narrower RL leaves that are wispy-sh but not as skinny and limp as full wispy like the sausage types or Sgt. Pepper's. Big Cheef Stripes in the back ground and a Dwarf Blazing Beauty on the left …hate it when I forget to turn the label to the camera. Have no clue what that one on the right is, but looks like might be another dwarf. They should also shoot up and be among the taller seedlings. 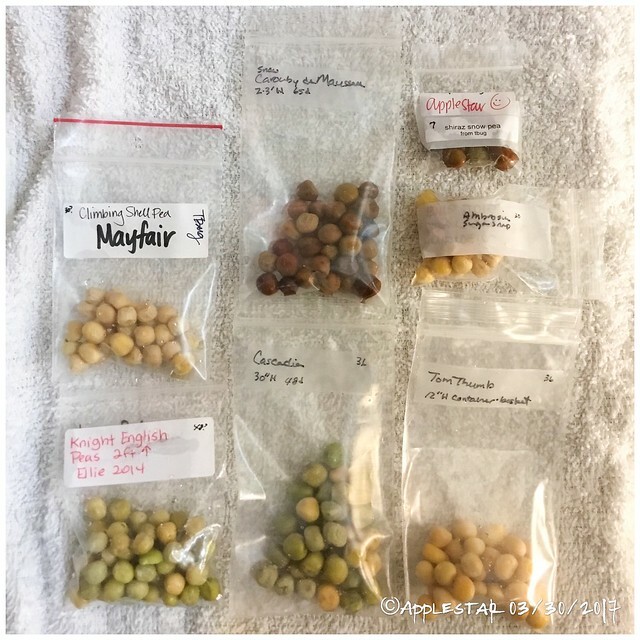 TPS (true potato seed) Amarosa (meb'15). They are slower to grow at first compared to other solanacea, but will become strong plants similar to tomatoes -- just more sprawling -- and will be planted after last frost. 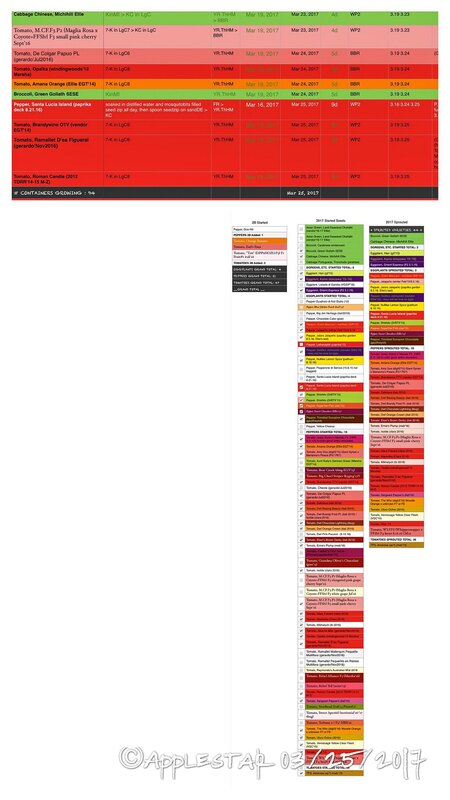 This looks like my answer to the Pill Bottle Soil Block issues -- i.e. not fitting satisfactorily in the Rice Milk carton and the seedlings needing to be smaller than I feel deserves the amount of space occupied. 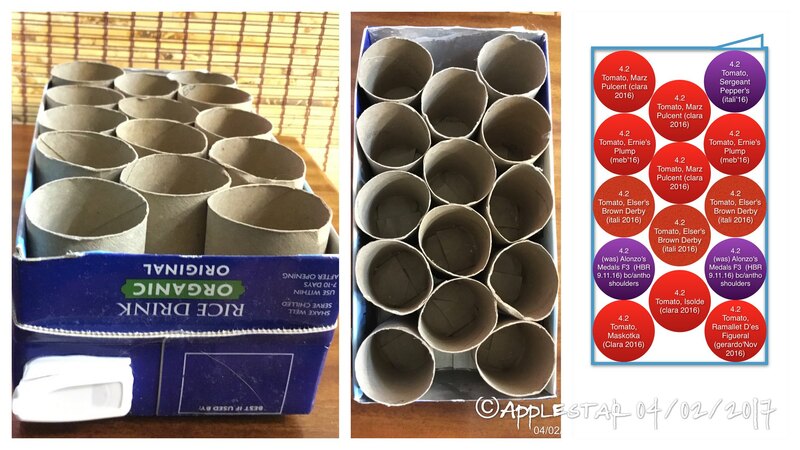 14 tubes per rice milk carton. The root-ball/potting mix slipped out of the Kcup fits right down the tube. ...more about this later.